Map of the Dravidian languages in India, Pakistan, Afghanistan and Nepal. Languages present in the dataset used in this paper are indicated by name, with languages with long (950+ years) literatures in bold. © Kolipakam et al. A Bayesian phylogenetic study of the Dravidian language family. Royal Society Open Science (2018). The origin of the Dravidian language family, consisting of about 80 varieties spoken by 220 million people across southern and central India and surrounding countries, can be dated to about 4,500 years ago. 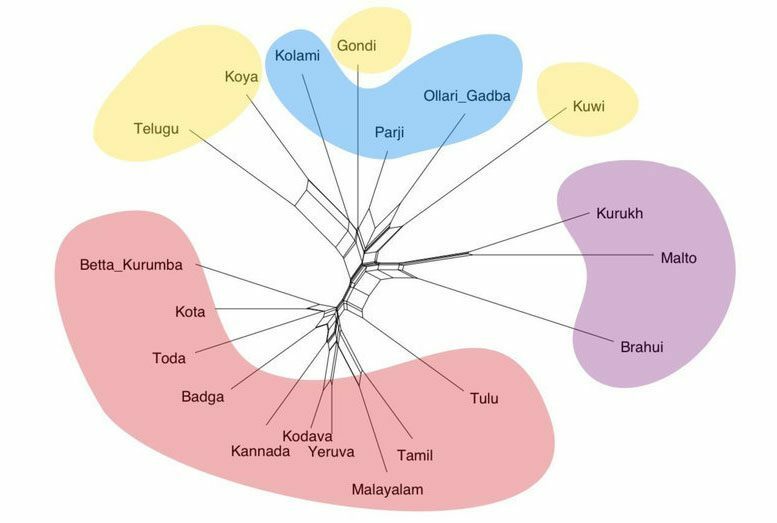 This estimate is based on new linguistic analyses by an international team, including researchers from the Max Planck Institute for the Science of Human History, that used data collected first-hand from native speakers representing all previously reported Dravidian subgroups. The findings, published in Royal Society Open Science, shed light on the prehistory of these languages and their speakers. NeighborNet visualization of lexical differences. The NeighborNet network identifies three groups, going in clockwise direction starting from Telugu in the upper left corner: South II+Central, North and South I. Color-coding gives subgroup affiliation, red = South I; blue = Central; purple = North; yellow = South II. © Kolipakam et al. A Bayesian phylogenetic study of the Dravidian language family. Royal Society Open Science (2018). Be the first to comment on "New Linguistic Analyses Dates Dravidian Language Family"